Hypo-allergenic, perfume-free, lanolin-free and non-greasy. I've tried several creams for my rough and dry skin, but this one tops them all. I especially love that it doesn't leave my hands greasy and slick afterwards, and that just a bit will work over a large area. Like many others I find this cream great for eczema prone skin, I recently had a terrible facial occurrence and within 3 days it was on the wane, and not painful, I use a natural hemp moisture cream over it and no problem at all, not oily as it says, a little goes a long way too. I have been using this cream for my problematic eczema skin for years. it's the only thing that my skin doesn't react to. I love how it doesn't feel oily after use. I got this small tube so I can bring it with me wherever I go!! I use this on my baby's face to help tame the dry skin and eczema that has cropped up now that winter is setting in. I have a larger tub in her nursery but use this product in our diaper bag for on-the-go applications. This creme was recommended by our family doctor when my daughter was an infant, for mild eczema. It has worked really well with small flare ups. We have purchased it multiple times. I brought this product as it was recommended by our doctor for my baby having dry skin. Initially I felt it to be greasy. After using this product for some time did get rid if the minute rashes and dryness on our baby's skin. I would recommend the product to a friend without doubt. Oh by the way, the greasiness wears off and you get used to it. This is a thick cream. Seems to work well for baby's eczema. I apply right after the bath. Small and easy to carry but more importantly the product is great, I have eczema problems on my hands, it helps alot to have something of travel size so close to me! I like that it is not scented, light and absorbs fast, but would like it to be a little richer. Overall though, would recommend this for those with reactive, sensitive skin. I have rosacea and am using metrocream for treatment, however as an evening facial cleanser, I mix abit of water with galaxal base and gently work it into my face and surrounding areas. It washes off beautifully and leaves my skin soft and supple. I used to use Estee Lauder and all the other expensive stuff - I wished I had discovered this sooner!. my doctor suggested this when I was having problems with dryness and redness on my face. I LOVE this cream. It not only helps with dry, red skin, it changes the appearance of skin all together. It makes my skin look firm and fresh. I also use it on my feet, elbows, and hands and it makes my skin so soft! I used it daily to prevent radiation burn. I have used it every day as foot cream/ face cream etc I use it for all the daily skin care. our winters are very cold. Works excellent for daily prevention of eczema for my baby boy. Apply right after nightly bath. Slight "medicine" odour, but you get used to it and don't notice the odour after a short while. Excellent to treat Eczema! Heals skin within 2 days. I have moderate acne and was using Benzoyl Peroxide at the time and my derm told me to stop cause it was drying out my skin. 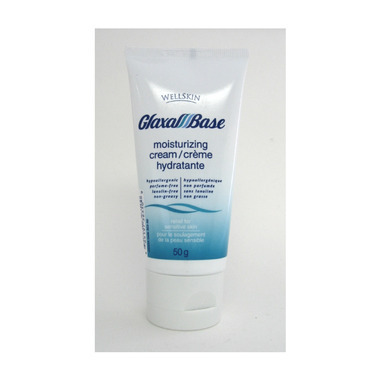 He then prescribed me Clindamycin mixed together with this Glaxal BaseAnd it really does soothe and moisturize my skin nicely. Years ago, in an Ottawa pharmacy/health food shop, I asked about a recommended moisturing cream. The shopkeeper replied, in effect "we have this house product, but our chief pharmacist uses Glaxal Base." So I bought some and liked it immediately. For value for money, convenience and ease of use, I have found Glaxal Base the best I know. Great cream. It helps with dry skin like nothing I have ever tried. It helps with sores on my face. It heals them half way over night. I have the worst dry hands, flaking skin, yuck! This was suggested to me by a pharmacist. I tried the small size, because I have tried so many that have ended up being given away or thrown out. Glaxal Base is ther best by far!!! !